Kristina Willey has been teaching music to young children for fourteen years. Brought up by a mother who taught music in the public schools and in her own home, Ms. Willey has been immersed in the culture of music instruction and discipline. She began her viola studies at the age of three and her past mentors include Dr. David Dalton, Dr. R. Kevin Call, Dr. Claudine Bigelow, Che-Yen Chen at the University of Southern California, and Yizhak Schotten at the University of Michigan. She currently studies with Caroline Coade at U-M where she is pursuing her doctorate on full scholarship. She is a member of the Flint Symphony Orchestra and performs with them regularly. 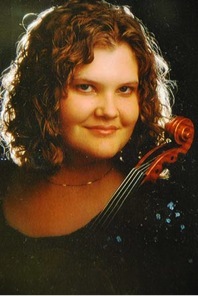 In the summer of 2012, Ms. Willey studied at the prestigious Schleswig-Holstein Musik Festival in northern Germany, where she served as principal violist, performing at venues in Hamburg, Salzburg, Lübeck, and Berlin, with esteemed conductors Christoph Eschenbach and Manfred Honeck, as well as composers Matthias Pintscher and Tan Dun. She has taught viola privately at BYU, USC, and U-M, and has also taught courses of music theory and ear training at BYU and BYU-I. A trained Suzuki teacher, she maintains a private violin and viola studio. In addition to her musical activities, Ms. Willey enjoys cooking, reading, and cycling.